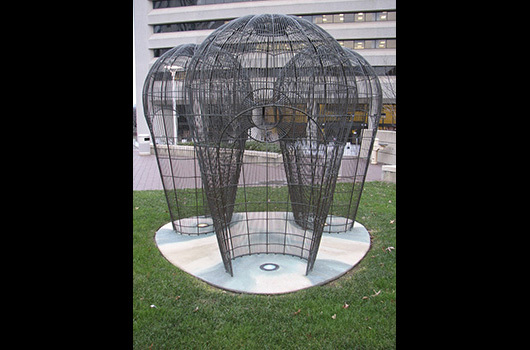 Kendall Buster describes her sculptures as “drawings in space”, referring to the open armature design that permits people to see through the structures. The grouping of chambers allows visitors to enter the sculpture and experience feelings of both confinement and security. The shapes spring from the artist’s interest in microbiology, which she once studied, in terms of her use of multiplied/replicating figures. The architectural forms and their supporting shells echo the oval shape of the plaza in which they are situated. 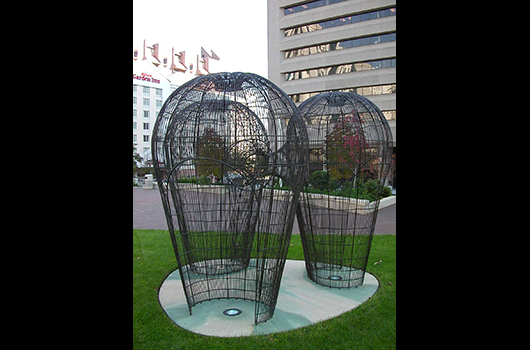 Whether you are inside or outside the sculpture, the artwork heightens your awareness of the ways in which we reveal and conceal ourselves in public spaces. Funded by Bell Atlantic (Verizon).